• Performance Improvements - The Hydra Viewer is several order of magnitudes faster than the OSG Viewer when drawing geometry. • Center of Interest - A fully controllable point of origin for light and camera transforms. • Ambient occlusion - Simulate soft shadows in the cracks and crevices of the objects. • Group transforms -Select groups of objects and apply transforms using a single manipulator. • Geometry subdivision - Draw geometry to three levels of subdivision. The Center of Interest in the Hydra Viewer. 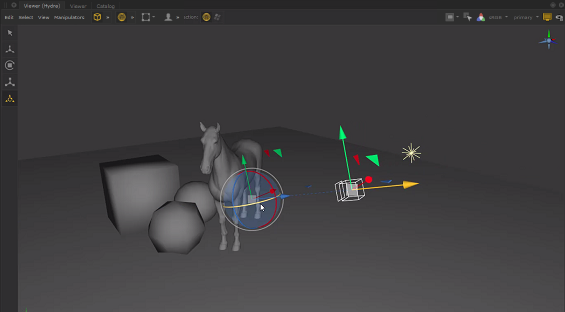 The Viewer (Hydra) tab provides one or more 3D windows into the scene described by the scene graph. Only locations that are exposed within the Scene Graph tab are represented in the Viewer - the exception being pinned locations. You can interactively modify parameters, on some nodes contributing to a scene graph location, using Manipulators within the Hydra Viewer. The manipulators available vary depending on the scene graph location selected, and the nodes that created it. To access the Hydra Viewer, navigate to Tabs > Viewer (Hydra).